"Teams of seventh grade boys, representing one team from each of the six Wakefield public grammar schools (Lincoln, Hurd, Franklin, Woodville, Warren and Greenwood), competed in the annual grammar school baseball tournament during May and June, 1930. Arranged by Wakefield High School coach Homer Shellenberger and sponsored by the Wakefield Lodge of Elks, the scheduled games were played on the Common, Harts Hill, High School (Walton Field), and Franklin School fields. The teams played two games each week for six weeks with a championship game played at the end of June. The championship game featured a close match between Franklin and Greenwood, eventually leading to a 5 to 4 win by Greenwood. Several 'clever' and 'pretty' plays were executed by both teams, keeping the outcome of the game uncertain until the last player was retired." -- Text from calendar by Jayne M. D'Onofrio. Greenwood team members included H. Duffill, D. Babb, R. R. Stantial, R. Yeuell, A. Pechett, E. Scott, McDaniel, Borland, J. Hall, A Hupprich, J. Todd, K. Christie, and W. Lloyd. Photo courtesy of the Bourdon family. 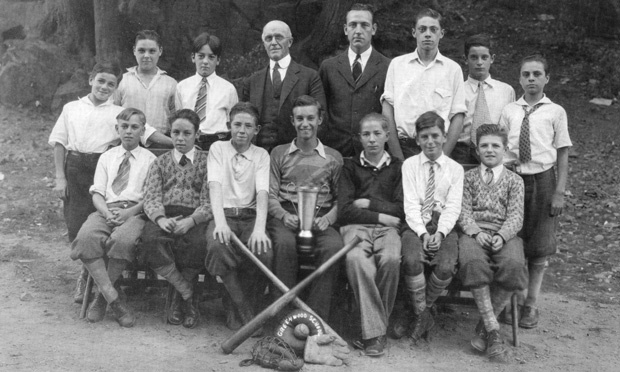 “Greenwood School, grammar school baseball champions, circa early 1930s,” NOBLE Digital Heritage, accessed April 22, 2019, https://digitalheritage.noblenet.org/noble/items/show/6963.